Tube power explosion! Our most compact ToneLab ever offers thirty-three different amp models with a versatile array of cabinets and effects to take your guitar playing to the next level – wherever you go. Introducing the Valvetronix series ToneLab ST; bringing true-tube pro-level sound to everyone. 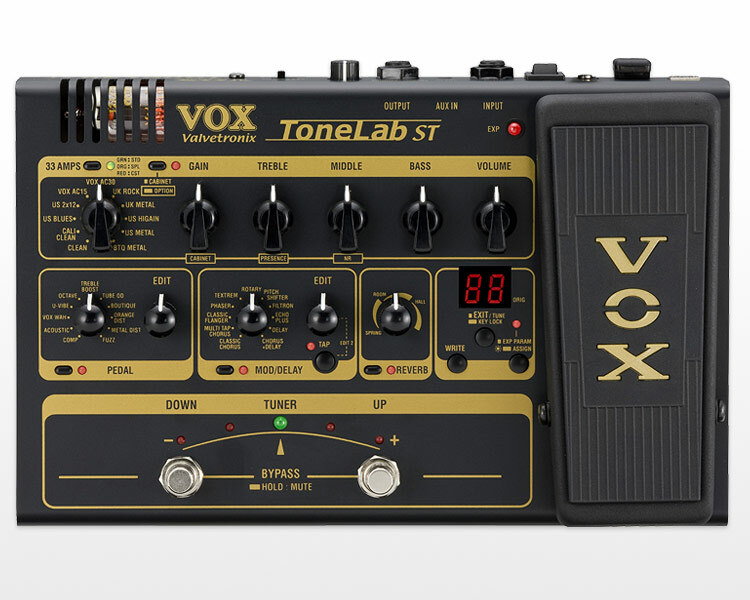 Twenty-five versatile effects allow ToneLab ST to be your one-stop tone shop – no other equipment required! Fifty preset programs are ready for immediate use, including twenty song presets. Fifty user programs are ready for your own custom sounds – for a total of 100 programs in memory! In addition to wah or volume, the expression pedal can be Quick-Assigned to nearly any effect parameter for realtime control! The Valvetronix series is the perfect example of VOX's unique, cutting edge vacuum tube modeling know-how; delivering a broad range of powerful sounds. From large amp stacks to mini-combo amps and multi-effect units, the series boasts a diverse lineup, and can be seen on stage, in the studio, and in the home. The ToneLab ST maintains the sophisticated specifications of the Valvetronix series, while packaging them into a compact unit that allows anyone to easily experience true tube powered sound. In addition to both amplifier and cabinet models, there are also a wide variety of expertly modeled effects. 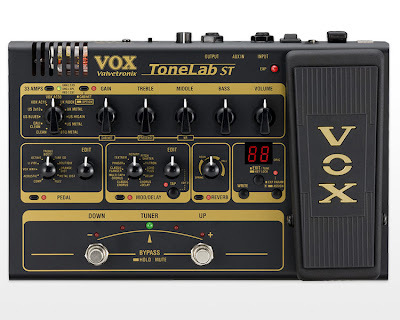 In a compact, easy-to-use format, ToneLab ST delivers classic vintage sounds, studio-quality and high-gain amps, even new amp models created by VOX. Effect parameters can be quickly assigned to the expression pedal, ensuring a limitless range of performance power. Sophisticated extras include an auto chromatic tuner, sound management software for your PC, and convenient USB audio interface operations. The ToneLab ST is designed to deliver the ultimate in tonal dexterity to the musician in any situation, from stage to studio and everywhere in between. The Valvetronix series was developed with painstaking attention to detail. The valve circuitry features a real 12AX7 vacuum tube – along with other components – to cleanly mimic the interaction that occurs in a tube amplifier in a way no digital circuit can. This distinguishes the ToneLab ST from other manufacturer’s modeling units. This fundamental difference is the basis for the awesome sonic power available in the ToneLab ST that no other multi-effect unit can obtain. Through the years, a handful of guitar amps have provided the inspiration and created the driving force behind the greatest guitar performances in history. ToneLab ST is equipped with thirty-three spot-on amp simulations, including vintage amps, coveted boutique amps, the latest high-gain amps, and entirely new amp models designed by VOX. But the ToneLab ST goes even further, adding eleven classic cabinet configurations that can be mixed and matched with any amp model. That’s 363 amp and cabinet combinations available instantly! A single ToneLab ST program contains amp, cabinet, pedal and modulation effect settings – even noise reduction options – providing enormous freedom and versatility for creating your own sounds. There are fifty preset programs for immediate use, covering a broad range of styles and playing styles. The preset programs include twenty song programs, able to instantly reproduce the familiar sounds of those great guitar songs that everyone will recognize. This way, you can enjoy the versatile sounds of the ToneLab SE right away – before you even consider creating your own programs. But when you’re ready, the ToneLab ST can hold fifty of your custom edited programs. Together with the preset programs, this gives you a total of one hundred programs, available on demand. The amp, cabinet, and effect settings can be saved into 120 programs locations. There are also 40 preset programs that contain classic settings for each amp model. The ToneLab ST provides an expression pedal that lets you control various tone shaping effects and parameters as you play. In addition to volume and wah, you can use the pedal to control realtime effect parameters – amplifier gain, tremolo speed, flanger depth, etc – providing a dramatic leap in expressive potential. The “Quick Assign” function lets you assign any effect parameter on the fly. By specifying the range of control, you can quickly create highly original performance settings. ToneLab ST is a complete ASIO-compatible USB audio interface. With a single USB connection, the ToneLab ST will conveniently interface with your computer DAW or sequencing software. ToneLab ST delivers the signal to your computer digitally, with no degradation in sound, for flawless recordings. Librarian software (Windows/Mac) for managing ToneLab ST programs will be available as a free download , and allows the easy exchange of data between users. An auto-chromatic tuner featuring great visibility is built right in. Mute and bypass functions allow you to tune unnoticed while on stage. The ToneLab ST’s powerful Amp/Line switch lets you instantly apply the appropriate compensation for a guitar amp, power amp or direct recording connection, so you can take full advantage of its full sonic potential in any situation. There's also an AUX IN jack so you can play along with the sound of your favorite band in nearly any format. Compact in size, the on-the-go ToneLab ST is big on features and huge on tone! Weight: 1.6 kg / 3.527 lbs.